This Bible belonged to, and was presumably made for, Robert de Bello (i.e. 'of Battle', near Hastings), who was abbot of the Benedictine abbey of St. Augustine, Canterbury, from 1224-53. He was clearly concerned to have an accurate text--it has been corrected carefully throughout--and his influence may be responsible for some of the very unusual imagery included among the initials. The evangelist symbol is Luke is the Ox. 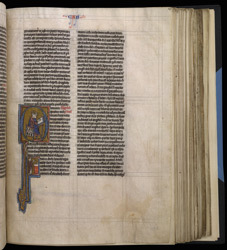 Here the Gospel of Luke is illustrated with an initial in which Luke, sitting writing, has an Ox's head. This iconography is not unique, but is certainly unusual, especially by the 13th century. The smaller initial shows Zacharias censing the altar (Luke 1:9).